Inquisiq is a powerful learning management system (LMS), with an award-winning, advanced feature set that has been meticulously designed with today's demanding workforce in mind. It enables you to easily upload and organize your SCORM-compliant content, manage your courses and course catalogs, coordinate users and groups, generate fully customized reports, and even sell your courses. Inquisiq is feature-rich without being bloated; providing all the functionality that you want and expect from an LMS while keeping the application affordable and simple to use. Inquisiq is the ideal solution for small to mid-sized businesses in all industries: training managers, HR directors, corporate trainers, courseware sellers, and SMEs. Since its initial release in 2002, Inquisiq R4 has grown to over 500 clients with over 3 million users. Years of experience and feedback from our clients have allowed Inquisiq R4 to be a lean, extremely well-designed, and dynamic application. The system is offered at a price that is far below the competition, and is available in both SaaS (cloud based with no set-up fees) or installed solutions. Never before has so much advanced automation been available at such a low price point. Inquisiq LMS is a seven-time Medal Winner of the coveted Brandon Hall Excellence in Learning Awards, including four gold medals. It is a straightforward, robust solution and its remarkable design and intuitive interface has the functions you need right where you expect them. Go to www.inquisiq.com for your free trial today. We love Inquisiq and we love ICS Learning Group!Inquisiq has allowed us to implement our learning structure, and it has offered several different ways to do so. There seems to be many different ways to set up the system to meet our needs. The interface is user-friendly and very attractive. We especially like the mobile responsiveness in the latest version of the software! The support team is fast and helpful in addressing any questions or concerns that we have. When we ask for new features in the LMS, they actually listen to us and pass the requests up to management, and we have even seen some of the things we have asked for implemented in the software! Inquisiq has allowed us to implement our learning structure, and it has offered several different ways to do so. There seems to be many different ways to set up the system to meet our needs. The interface is user-friendly and very attractive. We especially like the mobile responsiveness in the latest version of the software! The support team is fast and helpful in addressing any questions or concerns that we have. When we ask for new features in the LMS, they actually listen to us and pass the requests up to management, and we have even seen some of the things we have asked for implemented in the software! The LMS's ability to cater to so many different scenarios and companies can sometimes be a drawback. The many different implementation paths that we could take to execute our goals can be intimidating. However, the support team is always extremely receptive to getting on the phone with us to discuss our options and help us form an implementation plan that works for us. The team's subject matter experts' deep understanding of the system helps us to narrow down options to help us set up our system in a way that best fits our needs. Despite some limitations, I am very pleased with our decision to work with ICS and their Inquisiq product. I estimate that had we chosen one of the big three hosted LMS vendors; we would have spent an additional $15000 since March 2010. I am seeing constant improvements in the product and I am confident that which we consider shortcomings will be resolved in the near future. Since there is absolutely no risk with upfront costs and contract obligations, I recommend Inquisiq for small to medium sized LMS needs and possibly even for any large size LMS requirements. Other hosted LMS services require many $1000's, a commitment, and lengthy consulting before you are up and running. On the other hand, can be set up by you in a matter of hours for very little cost and no commitment. The top pros are: - No risks!! No contracts! - Ease of setup and management - Full access to graphics web margins that do not compromise our corporate branding (the others forced their own controls in the top margin) - Highly competent support staff that ALWAYS replies quickly! Usually in less than 2 hours - Full SCORM 2004 support (I have not encountered any issues) - Possibly the highest value for your dollar in this hosted LMS market - Option to purchase the LMS for self-hosting - No significant downtime - Batch new learner uploading is a huge time saver. I wrote an app to automatically convert our CRM output directly into Inquisiq readable format. I can now process over 100 learners in less than 1 minute! Other hosted LMS services require many $1000's, a commitment, and lengthy consulting before you are up and running. On the other hand, can be set up by you in a matter of hours for very little cost and no commitment. The top pros are: - No risks!! No contracts! - Ease of setup and management - Full access to graphics web margins that do not compromise our corporate branding (the others forced their own controls in the top margin) - Highly competent support staff that ALWAYS replies quickly! Usually in less than 2 hours - Full SCORM 2004 support (I have not encountered any issues) - Possibly the highest value for your dollar in this hosted LMS market - Option to purchase the LMS for self-hosting - No significant downtime - Batch new learner uploading is a huge time saver. I wrote an app to automatically convert our CRM output directly into Inquisiq readable format. I can now process over 100 learners in less than 1 minute! Great investment and exceptional value. You won't be sorry and you don't need a big but not "user friendly" system like SumTotal - why spend that kind of money and it doesn't work as nicely? Try it, you'll love it! Some companies will try and sell you on those big systems and several weeks deployment - that's crazy! You can deploy this with 1-2 employees for 10,000+ users in 2 weeks. The system is extremely stable, easy to use and easy to upload SCORM files. It does not take an ARMY to manage the system. You can manage the system with 1-2 empoyees for 10,000+ employees. 99.99% up time! Instant Email Notification for System Events Easy to use - some of our users are first-time computer users and they find their way the first time! User friendly for administrators too. Reporting is Robust - pull a report on any field or event in the system. Very easy to use. Developers Listen and Incorporate Enhancements Developers always pick up their phone! Everyone there knows what they are talking about and understands the system for the most part. The system is extremely stable, easy to use and easy to upload SCORM files. It does not take an ARMY to manage the system. You can manage the system with 1-2 empoyees for 10,000+ employees. 99.99% up time! Instant Email Notification for System Events Easy to use - some of our users are first-time computer users and they find their way the first time! User friendly for administrators too. Reporting is Robust - pull a report on any field or event in the system. Very easy to use. Developers Listen and Incorporate Enhancements Developers always pick up their phone! Everyone there knows what they are talking about and understands the system for the most part. Updates are not scheduled regularly or well documented. The only trackable online lessons are SCORM - unable to load and track PowerPoint (although there is the ablity to track classroom training and upload materials). Unable to use the system to convert PowerPoint to SCORM. System user guide needs additional documenting - the guide does not provide extensive details on how to use the system. It is basic but could be much better. We learned the system via testing, trial and error. We investigated 13 other LMS vendors before choosing InquisiqR3 - I have ZERO regrets about our decision. This is a superior product, providing a great compromise of features and usability. A long list of features that you won't actually use will not help you to achieve the objectives of your programs. A system your team can use and will like working with is key to success in my experience. This product recieves my highest personal recommendation.eHealthSolutions has been quite pleased with our licensing of InquisiqR3. We needed to train several thousand customers in a very short period of time in order to support the federally mandated MDS 3.0 changes to our product. All users needed to be trained, assessed, and reported within a two week period before 10/1/2010. We accomplished this goal with relative ease hosting our training through InquisqR3. I have extensive experience with learning management systems, having purchased them for both small and large companies. My present team, however, did not have much experience at all. They (and I) have been very pleased with the ease of use and level of functionality we get with InquisiqR3. Frankly many systems provide features that add complexity but relatively little value. ICS Support has been fantastically responsive. They are friendly and knowledgable. We use the hosted version of InquisqR3 and have had virtually no down time. eHealthSolutions has been quite pleased with our licensing of InquisiqR3. We needed to train several thousand customers in a very short period of time in order to support the federally mandated MDS 3.0 changes to our product. All users needed to be trained, assessed, and reported within a two week period before 10/1/2010. We accomplished this goal with relative ease hosting our training through InquisqR3. I have extensive experience with learning management systems, having purchased them for both small and large companies. My present team, however, did not have much experience at all. They (and I) have been very pleased with the ease of use and level of functionality we get with InquisiqR3. Frankly many systems provide features that add complexity but relatively little value. ICS Support has been fantastically responsive. They are friendly and knowledgable. We use the hosted version of InquisqR3 and have had virtually no down time. It would be super to have threaded discussion groups attached to courses - but there are ways to get around that. In addition to the reasons listed above, we see an even greater value in the support we receive from the ICS team on a minutes notice. The team is responsive and willing to help our team work through alternatives for our LMS applications. We are so pleased with our service and the abilities the ICS Learning Group offers that we wouldnt consider going to another LMS provider especially since we see them as honest and dependable business partners. The team treats you more like a business partner than a customer.The LMS is intuitive and not complicated. The system is consistently up which allows us and our customers to access courses and obtain tracking data easily. I love being able to login online to the Support Center and request assistance electronically. The ability to track training information and have access online is invaluable to our business and education customers. For over a year we reviewed numerous Learning Management Systems and what we found was that the LMS offered by ICS Learning Group offered the most value, provided the simplest approach for launching our content online, and provided the most honest and upfront pricing of all of the LMS providers that we analyzed. Microburst Learning does not have to hire an entire IT department to manage our LMS and the delivery of our content, ICS includes that service as a part of our package. The LMS is intuitive and not complicated. The system is consistently up which allows us and our customers to access courses and obtain tracking data easily. I love being able to login online to the Support Center and request assistance electronically. The ability to track training information and have access online is invaluable to our business and education customers. For over a year we reviewed numerous Learning Management Systems and what we found was that the LMS offered by ICS Learning Group offered the most value, provided the simplest approach for launching our content online, and provided the most honest and upfront pricing of all of the LMS providers that we analyzed. Microburst Learning does not have to hire an entire IT department to manage our LMS and the delivery of our content, ICS includes that service as a part of our package. Tends to be somewhat more complex regarding the reporting features than the EX version. However, the features far outweigh this complexity. Inquisiq has multiple pricing models and can scale to meet the needs of any size client. Choose between a monthly cloud-based SaaS account (starting at $199/month) or a one-time purchase perpetual license with unlimited users for under $15k. 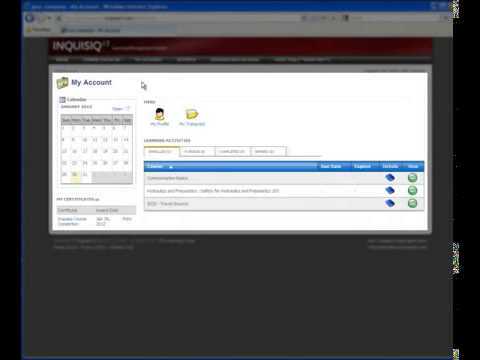 The powerful automation built in to Inquisiq can provide significant administrative time savings. After an initial customization of the registration forms and grouping rules, establishing the enrollments and permissions for various groups, and setting-up reports and subscriptions, LMS administration becomes largely hands-off. This provides a significant value to customers who do not have dedicated LMS Admins, and for those retail customers who setup eCommerce, negating the need to micromanage payments and enrollments. Inquisiq is well known for its optimum feature set and has won multiple awards for a well-designed interface which focuses on ease of use. This advanced feature set, in a pricing structure usually seen on systems with half the power, distinguishes Inquisiq as an uncommonly high value to the discerning customer. Inquisiq truly offers the right functionality, without the complexity, at an unbeatable price. Below are some frequently asked questions for Inquisiq LMS. Q. What type of pricing plans does Inquisiq LMS offer? Q. Who are the typical users of Inquisiq LMS? Q. What languages does Inquisiq LMS support? Q. Does Inquisiq LMS support mobile devices? Q. Does Inquisiq LMS offer an API? Yes, Inquisiq LMS has an API available for use. Q. What other apps does Inquisiq LMS integrate with? Q. What level of support does Inquisiq LMS offer? Q. Which apps is Inquisiq LMS compared to most often?